Staying with us you feel a strong sense of local history. Laplanders have acquired sustenance from forests and trees for decades. Log driving has been part of life in Kemijärvi, with books and movies made about the everyday lives of log drivers. Uitonniemi was a genuine base of operations for log drivers and one of the most beautiful shore destinations in the expansive lake district. Today, Uittonniemi operates as a tranquil base for tourists. The roots of Uitonpirtti Cabin date back to 1946 when it was established in Uitonniemi as the base of operations for the logging sites of East Lapland. Back then, among other functions, the cabin had a telephone exchange to ships and a restaurant for workers. Today, the cabin operates as a private restaurant for hire for the log-built hotel and a venue for banquets and meetings. The cabin also holds the hotel’s reception and the breakfast restaurant for accommodation guests. The historical buildings and are of Uitonniemi are owned by local entrepreneur Lasse Ketonen, who is also renowned for being the founder and entrepreneur of hotel and restaurant Mestarin Kievari, and the captain for Kemijärvi boat cruises who always has plenty of interesting stories to tell. GThe guesthouse manager and hostess is Johanna Korkeaoja, who also organises nature travel services in the area. Her love of Lapland and its nature was confirmed with a decision she made over 20 years ago to relocate to Kemijärvi from South Finland. 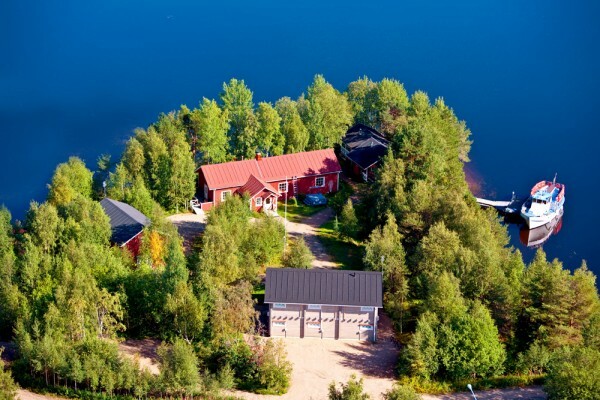 Guesthouse Uitonniemi is located on the shores of Lake Kemijärvi, approximately 300 metres from the town centre of Kemijärvi. The peaceful grounds house private restaurant Uitonpirtti, the log-built hotel, lakeside sauna and lounge with fireplace, and the Old Granary. Making this your holiday home makes it easy to take day trips in the surroundings. Just a short drive away are the Pyhä-Luosto National Park and the ski resorts of Suomutunturi and Salla. We want to create for our guests a tranquil holiday environment, a place to stop for a break and the opportunity to experience the revitalising power of nature. in Lapland’s lake district, close to five different fell highland resorts.